It's always swimming season in Arizona; so Breyer Law Offices, P.C. wanted to share some interesting, and scary statistics regarding drowning to remind everyone that drowning is a real threat; and anyone could be at risk. 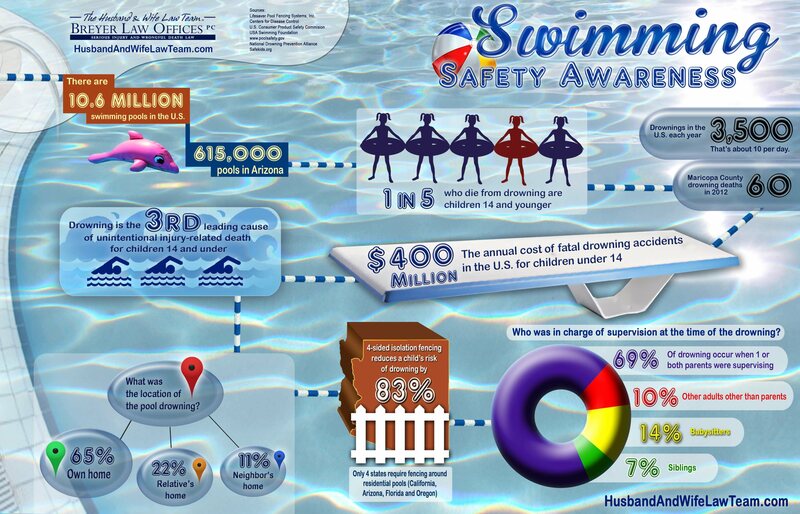 Phoenix swimming pool accident attorneys Mark and Alexis Breyer, the Husband and Wife Law Team, have designed this Infographic to show some of the most shocking statistics regarding swimming accidents. They hope it serves as an eye-opening reminder to all to not only watch children around water, but talk to them - early and often - about water safety. Phoenix Swimming Pool Accident AttorneyDisclaimer: The legal information presented at this site should not be construed to be formal legal advice, nor the formation of a lawyer or attorney client relationship. Any results set forth herein are based upon the facts of that particular case and do not represent a promise or guarantee. Please contact an attorney for a consultation on your particular legal matter. This web site is not intended to solicit clients for matters outside of the state of Arizona.